Magnolia trees have reputations for attractive flowers and fine foliage, with some species being of an evergreen nature. Coming in a variety of sizes, magnolia trees are native and non-native plants, with several growing wild across parts of eastern and central North America. Their features make them prized landscaping trees. Magnolias serve as specimen trees, foundation trees and patio trees, among other uses. Among the magnolia species hailing from the United States are the southern magnolia (Magnolia grandiflora), the sweetbay magnolia (Magnolia virginiana), the cucumbertree (Magnolia acuminata), the umbrella magnolia (Magnolia tripetala) and the Ashe magnolia (Magnolia ashei). The Kobus magnolia (Magnolia kobus) is a tree originating in Japan. Many hybrids of the various magnolia trees exist as well, among them the Little Gem and Edith Bogue, cultivars of the southern magnolia. The largest of the magnolias include the southern magnolia, which grows to 80 feet, and the slightly taller cucumbertree magnolia, which attains 90 feet on occasion. The sweetbay magnolia sometimes spring up to be 60 feet tall in southern climates, but struggles to grow to 30 feet in the northern part of its growing range. Smaller magnolias such as Kobus magnolia and umbrella magnolia are in the range of from 10 to 30 feet high. Smaller hybrids of magnolias are available for yards with limited space. Little gem stays between 15 and 20 feet high. Large leaves are not uncommon for magnolias, with the southern magnolia having foliage as long as 10 inches and the umbrella magnolia featuring leaves between 12 and 24 inches in length. Southern magnolia is evergreen, but other species are deciduous, with the exception of some sweetbay trees growing in warm areas of the south. The flowers are a huge selling point of magnolia trees. For example, those of umbrella magnolia can be 10 inches across. Most bloom during the middle of spring and continue flowering sporadically for the rest of the growing season into autumn. Once flowers finish blooming, they begin a transition to ornamental seedpods, with brightly colored berries. 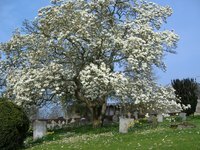 Some magnolia species are suitable for planting in cooler climates and have a large growing range. The cucumbertree magnolia is one, able to survive from U.S. Department of Agriculture plant hardiness zones 3 through zone 8. Others are not so cold-hardy, such as Kobus magnolia, which handles USDA zones 5 through 8. Southern magnolia lives up to its name by growing between USDA zones 7 through 9, while the sweetbay magnolia grows from USDA zones 5 into zone 10.